Mildred Marie Bekker left behind her four-year struggle with breast and lung cancer on April 6, 2019, when she was welcomed into her heavenly home as a child of God. Millie was born on her grandparents’ farm on April 3, 1931. She graduated from Holland High School and Western Michigan University and was retired from teaching in the West Ottawa Schools. 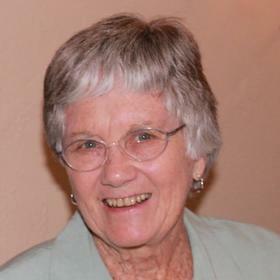 Mrs. Bekker was a charter member of Fellowship Reformed Church where she served in many ways. Millie loved life and all those she met along the way, wherever she went. During their retirement years Millie and Paul spent their winters in warmer places. In their love of travel they cruised or traveled to six continents and many countries. Millie had also visited every state. She also volunteered for many years at Holland Hospital including serving on the auxiliary board. She was active at Evergreen Commons as a member and volunteer. Her membership in AAUW saw many years helping with the book sale. She loved reading and her book group was special to her. Their support during her illness was a blessing. Millie enjoyed playing cards with friends, watching the Tigers, writing, and playing golf. Even though her family was not nearby she and Paul went to see many of their grandchildren’s concerts, sports activities and graduations. Mrs. Bekker is survived by her husband of 66 years, Paul; her loving children Karen (Dr. Michael) Warner of Glen Ellyn, IL, Tom (Tricia) Bekker of Farmington Hills, and Kris Bekker of Waukee, IA; her special grandchildren Pastor Kevin (Adrianne) Warner of Des Moines, IA, Sean (Whitney) Warner missionaries in Danli, Honduras, Trent and Leah Bekker of Farmington Hills, and her precious great grandchildren Mitchell, Phoebe, James, and Lucia. She is also survived by her very special brother Wally (Karen) Rooks, sister-in-law Gari Bekker, and brother-in-law Paul Breuker; dear nieces and nephews and their families, cousins, and dear supportive friends. Her mother and father, Ben and Gertrude Rooks, sister Pat Breuker, brother-in-law Dale Bekker, and sister-in-law Marge Bekker preceded her in death. A memorial service will be at 1:00 p.m. on April 15th at Fellowship Church, 2165 W Lakewood Blvd, Holland. Visitation will be from 11 a.m. -1 p.m. preceding the service. Pastor Jim Baar Officiating. Memorial contributions may be made to Hospice of Holland - 270 Hoover Blvd Holland, MI 49423 or Fellowship Church.